These are really gooey. Yum! Preheat oven to 350 degrees F (175 degrees C.). Grease and flour an 8-inch square pan. In a large saucepan, melt ½ C. butter. Remove from heat, and stir in sugar, eggs, and 1 teaspoon vanilla. Beat 1/3 C. cocoa, ½ C. flour, salt and baking powder. Spread batter into prepared pan. Combine 3 T. softened butter, 3 T. cocoa, honey, 1 t. vanilla extract, and 1 C. confectioners’ sugar. Stir until smooth. 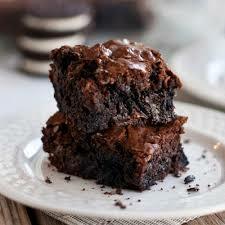 Frost brownies while they are still warm. You can always add a scoop of ice cream on top! YUM! The photo & title almost makes me drool. Just don’t sit at your computer when you do. That might short it out!